In a state that boasts one of the best public university systems in the country, it is not surprising that Maryland private colleges draw students from all over the world. Schools, colleges, and universities in the "Free State" lead the way in so many academic and athletic areas. Perhaps Maryland's close proximity to Washington, DC helps it curry favor in the form of increased federal spending. Or perhaps Maryland private colleges excel because they are conveniently situated between four major metropolises (Philadelphia, Manhattan, Baltimore, and the nation's capital). Maryland private colleges and universities offer a wide range of education programs with degrees and certificates up to the doctoral level, as well as professional degrees such as law and medicine. There are 53 colleges in Maryland, 30 public and 23 private, offering a wide range of programs and majors. These Maryland private colleges are diverse in character, academic emphasis, and origins. Some private colleges or schools have a religious affiliation; others are secular. Private colleges and universities may be profit or non-profit institutions. Typically, Maryland independent colleges or private schools give weight to personal characteristics and activities in addition to considering GPA and test scores. 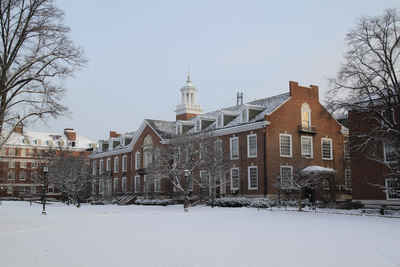 The largest being Johns Hopkins University with 13,497 full time students. St John's College is the most expensive with an in-state tuition of $44,554. On average, how much does it costs to attend private college in Maryland? The average annual in-state private college tuition in Maryland is $27,716 in 2013. MICUA is a voluntary association that provides public policy leadership in support of independent higher education, fosters cooperative efforts among member institutions and Maryland's public colleges and universities, serves as the official liaison between independent higher education and the State and Federal governments, and informs the citizens about the significance of its 15 member institutions. Collectively these 15, fully accredited colleges and universities provide unique educational opportunities to 63,000 students annually, the majority of whom are Maryland residents. The MICUA member institutions have had a remarkable impact on the State's economic vitality, cultural enrichment, social betterment, and community fabric for over 230 years.